I can adjust this photo to make the colours more true to life - less blue. I tried it. I didn't like it. I like this faded original better. For all that I've encouraged you to follow a tree for a year when I set out to visit mine I almost always go with a heavy heart and the expectation of boredom. Why did I choose a pine? Pines don't 'do' anything The answer of course, is the same as the complaint - they don't 'do' anything. I wanted a challenge. But if I had to chose a challenge, why did that have to include the lowest branches being masses of feet above my head? I simply can't see what's up there. I revisit the bark. I revisit the plants at its foot. I might find and insect in the road. I've done it all (yawn, yawn) - would there be anything new? How could there be. 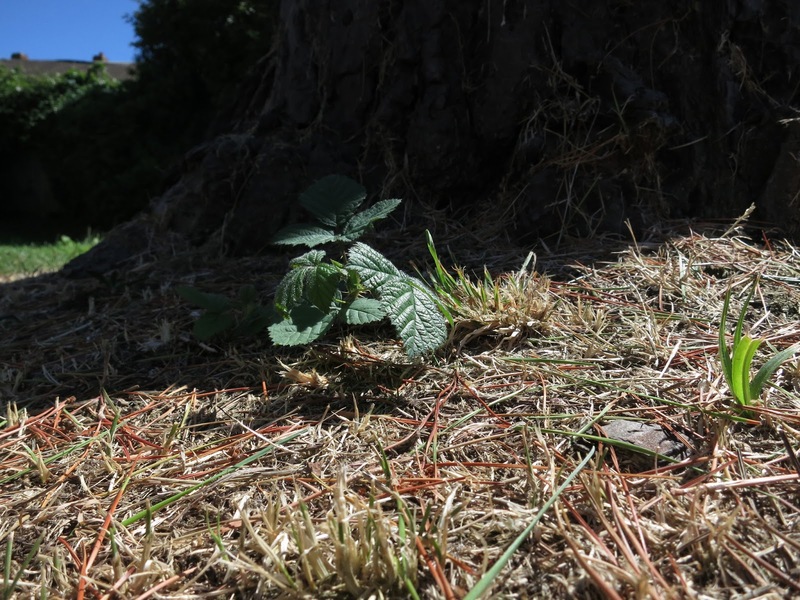 What there was - was one of the most startling experiences I've had with any tree. And if I hadn't stood there wondering what to photograph, I would never have known . . . the very fact I had to stand there was what brought me something wonderful and new. I'll save it for the end. First though - I'm learning how frequently the grass is mown. The Chickweed (Stellaria media) which was there in March and April has gone and a bramble has taken its place. 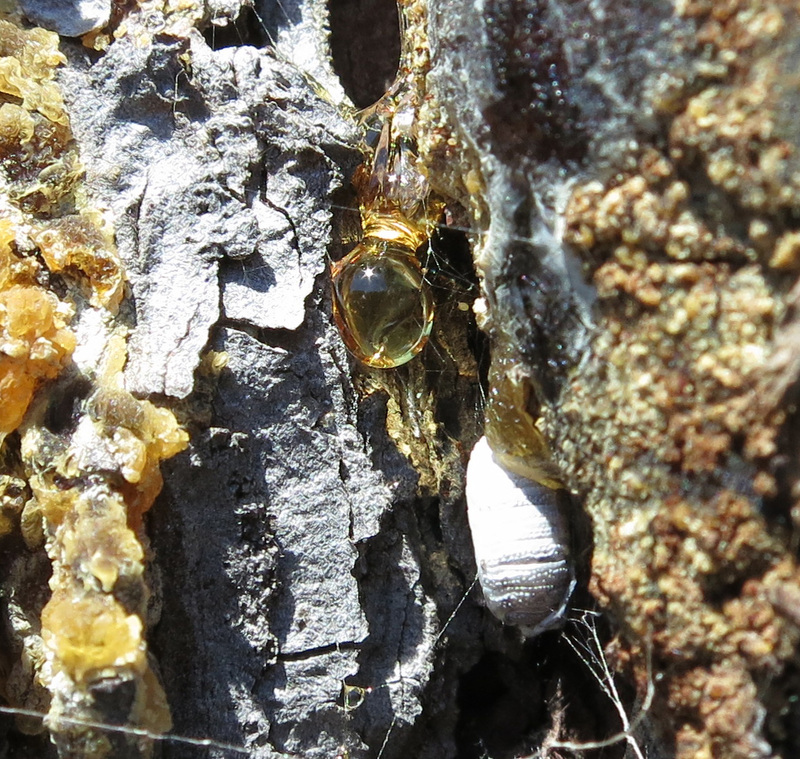 On the trunk - there's a yellow snail resting in a crack in the bark..
And here's the resin I can't stop being intrigued by. The sun is making a star on a globule. And . . . and . . . when I get home and crop the picture I notice there's an odd white thing in the frame. I'ts probably about 4mm long. Anyone know what it is? 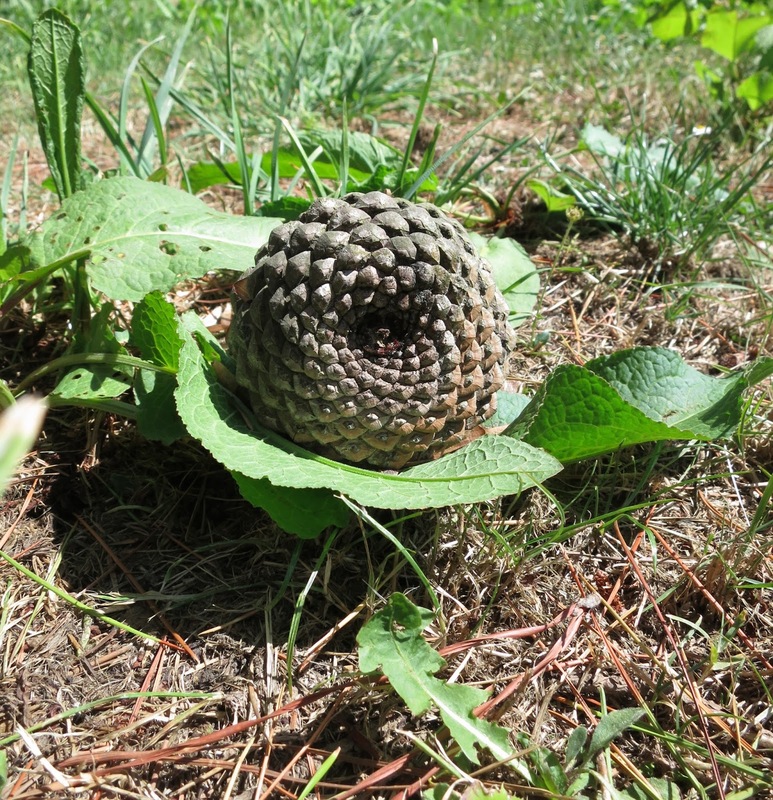 At the time though, I was so entranced by the globule I'd forgotten to take care of my feet - and stumbled over this cone. Other cones I've found have been brown and closed. This one is green on the outside - and inside, if you look, the colour is a beautiful chestnut brown. A careful designer could have made this cone. I'd cover a sofa in its colours. On it's back, where the cone was attached to the tree, you can see how the scales (scales? is this a dragon?) 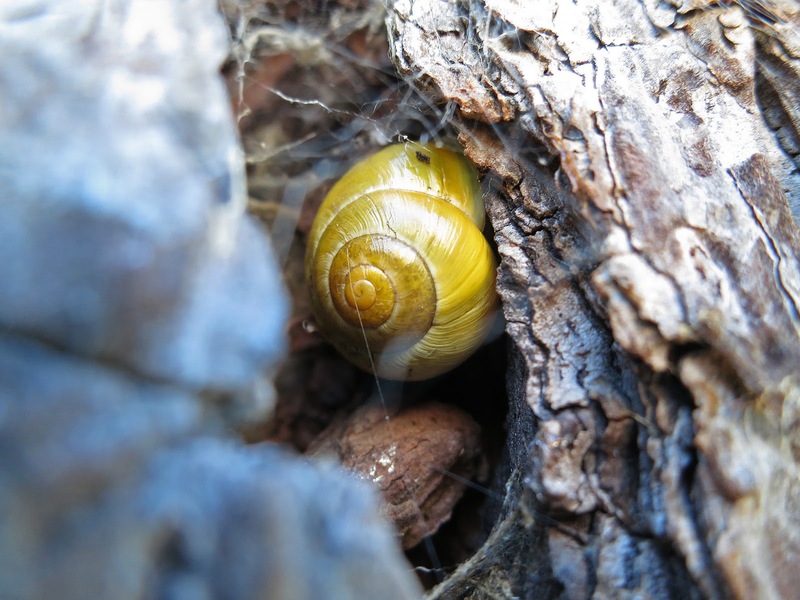 are arranged in whirls reminiscent of the snail on the other side of the tree. But . . . but . . . something is happening. There's a strange and persistent clicking. I'd assumed a child was tapping something while walking down the road. I turn. There's no-one there. Maybe someone's playing with a clicker in a nearby garden. If so, it must be a specially interesting clicker because they won't stop. All the time they click and click and click. Then, all of a sudden, they click loudly in a burst. Clickclickclickclick . . . But it isn't a child. It isn't a clicker. It's the tree. I cross the road to where there are others like it. They are doing it too. The only way I can record sound is to take a video. So here is our tree - not moving but 'talking'. I imagine the cones are opening their scales to eject their seeds. You might want to turn up the sound to hear. Would you be interested in following a tree for a year? It's not too late to join. Click the emblem to find out how. 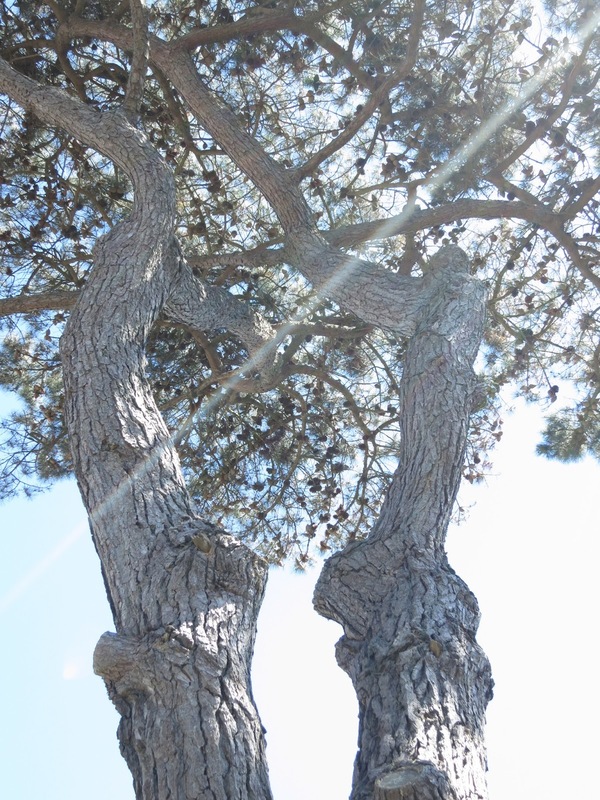 Click here for Tree Following posts written by other bloggers in July 2014. All photos in this post - and the video - were taken on July 10th 2014. That is a pretty amazing observation Lucy, well done for capturing it. Fibonacci spirals catch me every time! oh wow a talking tree just like in lord of the rings! Love this post, so much more interesting than mine, I guess because you are able to walk around your tree where as mine is in a field behind a wire fence! next time I might choose one a little more accessible! You realise you'll have me going out now tomorrow and listening to my pine tree... bizarre! wow, that's wild! What a neat discovery. The cone is beautiful -- I like the contrasting colors. It is a chrysalis...Pine Moth? I've never hears a tree speak. Pine cones do make that noise when they are on fire. The sound is amazing! I felt the catkins parachuting down from my tree onto my head but there was no noise. Well, except an "ouch" from me! The sounds of those seeds being ejected must be sounds of birthing pains! There is no limit of pine cones where I live. 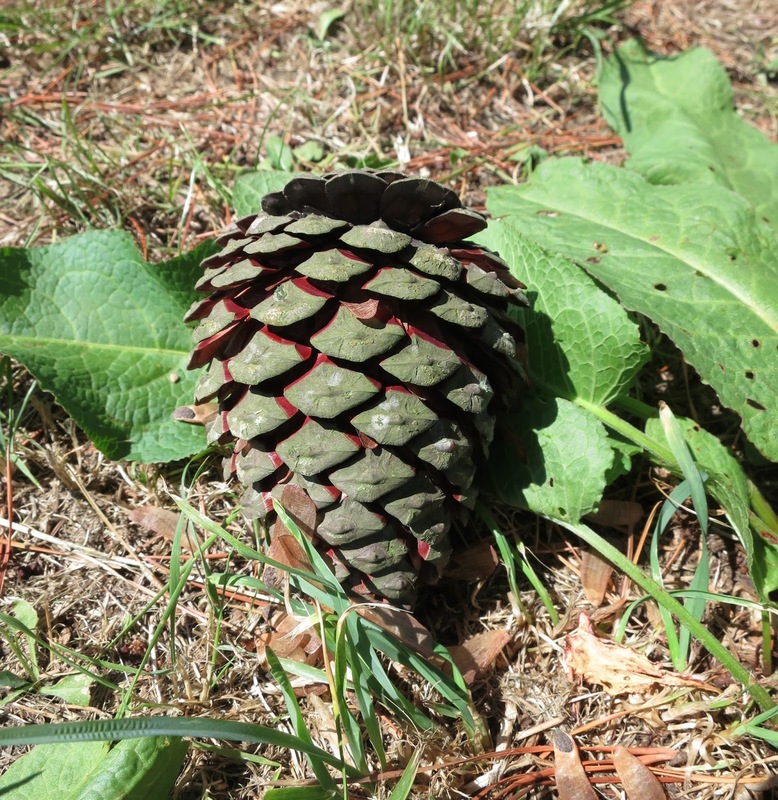 But most are much smaller than your lovely pine cone! Great post, and well done for capturing the sound, you might not be there at the right time ever again, I remember watching trees producing great puffs of spaws, and felt very privlaged to have witnessed this. The cones look beautiful . Is that REALLY the tree, with no help from small creatures? Woo! Love the cone - very Christmassy colours. Is that white blob by any chance a faded wood louse? Or something yet more exciting? You are noticing so many things with your tree and what a large cone....I adore that they are talking to you! Wow that is amazing. This meme is so interesting, even if what I discovered this month was not that good. I have just made it by the skin of my teeth this month, but I would hate to miss one. It is good that you give us a week to add our links.